Narsingdi, Dec 8 (Just News): A trucker and his helper were killed and five labourers injured in a road accident on Dhaka-Sylhet highway in Belabo upazila on Friday morning. 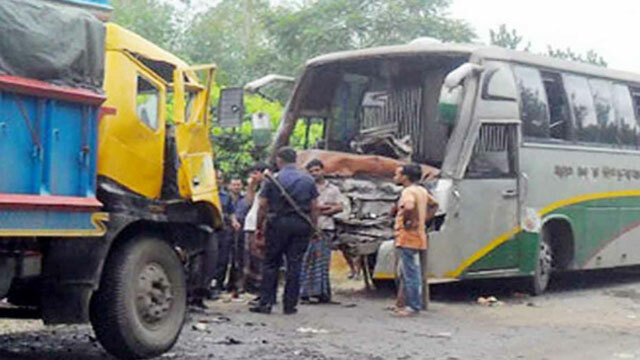 Kawser Hossian, officer-in-charge of Bhairab highway police station, said the accident took place when a Dhaka-bound bus collided with a Bhairab-bound truck, carrying labourers, around 6:30am, leaving the duo dead on the spot and five others injured. On information, police recovered the bodies of Saddam Hossian, 25, driver of the truck and his helper Sarwar Mia, and sent those to Sadar Hospital morgue.